Peacekeepers with the United Nations Multidimensional Integrated Stabilization Mission in the Central African Republic (MINUSCA) on patrol in Bambari. The United Nations chief has strongly condemned Sunday’s attack that killed a peacekeeper in the Central African Republic (CAR); the second ‘blue helmet’ to lose his life there in the space of a week. “This brings to five, the number of peacekeepers killed in targeted attacks in the Central African Republic since January 2018, with two attacks occurring in the span of a week,” UN Spokesperson Stéphane Dujarric said in a statement issued on behalf of Secretary-General António Guterres. 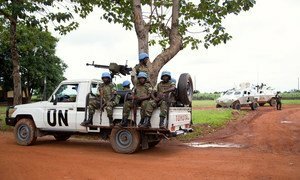 The latest attack by armed insurgents on the UN peacekeeping mission in CAR, known by its French acronym MINUSCA, resulted in the killing of a peacekeeper from Burundi and the wounding of another while they were on patrol in Bambari, in the centre of the country. On 3 June, an attack by armed insurgents killed a UN peacekeeper from Tanzania and injured seven others while they were patrolling in the country’s west. The Secretary-General “urges the Central African Republic authorities to spare no effort in investigating and identifying the perpetrators so that they can be swiftly brought to justice,” Mr. Dujarric said, recalling that attacks against UN peacekeepers may constitute a war crime and that sanctions can be applied against perpetrators who are brought to justice. In the statement, the Secretary-General offered his deepest condolences to the family of the deceased as well as to the Government of Burundi, and wished a swift recovery to the injured. United Nations Secretary-General António Guterres has strongly condemned Sunday’s attack that killed a UN peacekeeper from Tanzania and injured seven others while they were patrolling in the west of the Central African Republic (CAR).